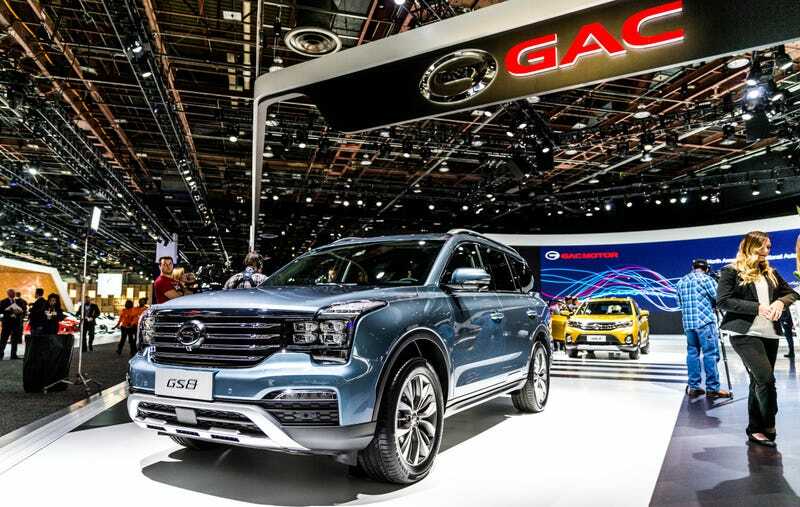 Amid the usual auto brands who come to these kinds of things like Chevrolet and Toyota, the hundreds of thousands of visitors who go to the public says of the Detroit Auto Show will see a name they may not be familiar with: GAC, or the Guangzhou Automotive Co. Group. This is because this Chinese company does not sell cars in the U.S.—but next year it plans to, its leaders reiterated at a press conference here. If GAC has its way, and if it’s successful in recruiting American dealers, then its sedans, SUVs and minivans at the auto show will be driving on American roads a year from now. It will be the first major jump into the U.S. market by a Chinese company. China’s auto industry has ramped up to the point where it’s now the biggest and most important car market in the world, but by and large those cars haven’t made their way to our shores. There have been a few exceptions, like a handful of Chinese-built Volvos and Buicks and Cadillacs, but the scale hasn’t been there, and the Chinese brands themselves have stayed out. Until now, apparently. But given the importance of the Chinese auto industry, Chinese cars in America have long seemed inevitable. (There’s also the Chinese-backed tech startups, but many of those are far from being actual car companies that can mass-produce what they promise.) GAC has been teasing a move to the U.S. for at least five years, but now they say it’s finally happening. Besides, Japan and South Korea have become power players in our market, so what’s to stop China? The Trumpchi brand might prove problematic in the U.S., and company executives have said they may launch a new brand, instead. Also, GAC must demonstrate that its vehicle quality is U.S.-grade. The company likely will note that J.D. Power’s Initial Quality study has ranked GAC the top-scoring Chinese automaker for the past five years. The company considers its quality good enough to market the Trumpchi brand in 14 countries. But the U.S. would be the toughest export market of all, Yu acknowledged. On the floor in Detroit, the cars from GAC—somewhat humorously placed across from those of GMC—come in all shapes and sizes, ranging from small sedans to the big seven-seat GS8 SUV set to go on sale in America in 2019. (They’re smart enough to lead with the big crossover first.) They have an interesting electrified concept car with no side windows as well. All the signs are there that GAC wants to be seen as any other automaker to Americans. The cars are nice, if a bit generic and nondescript in design, and at first glance higher in quality than many Americans might expect. The interiors feel a couple years behind being cutting edge—they’re still big on buttons, though that may be a boon to some—but they’re worlds better in features, quality and polish than the Trumpchi cars we saw at this very auto show just five years ago. Also, GAC is opening a technical center in Silicon Valley, and plans a design studio in Los Angeles and engineering operations here in Detroit. “Certainly it’s our hope to work with FCA in the North American market,” Feng said through a translator. “They are like a mentor to us. So I would hope FCA would work with us to penetrate the U.S. market” — a suggestion two ranking FCA executives downplayed. But as with any new brand entering this market, there’s a lot of questions. What will the dealer network really look like? How will the cars be priced and marketed? And will Americans buy them? I think it’s a safe bet, at least given historical precedent, that they’ll be priced a lot lower than traditional competitors at first. But we’re not buying cheap cars right now, we’re financing $35,000 (usually more) brand new SUVs by financing them for the better part of a decade. GAC may be here, sure, but it’s up against quite a bit if it wants to gain a foothold in this market. At least at first. In the meantime, if you’re at the Detroit Auto Show during public days, stop by GAC and check out their cars. You may be the among the first to see the future. We’re not sure what this is all about, either.